"And we thought 2017 was a big year!" she wrote on Instagram. Ms Ardern, 37, is now set to be the second elected world leader to give birth while in office - and the first to do so in almost 30 years. In 1990, Benazir Bhutto gave birth to a daughter while serving as Pakistan's prime minister - in what was reported to be a first for an elected leader, rather than royal families. Ms Ardern became New Zealand's youngest prime minister since 1856 when she formed a centre-left coalition in October. Ms Ardern's Labour Party came second in September's election, where no party was able to secure a majority. 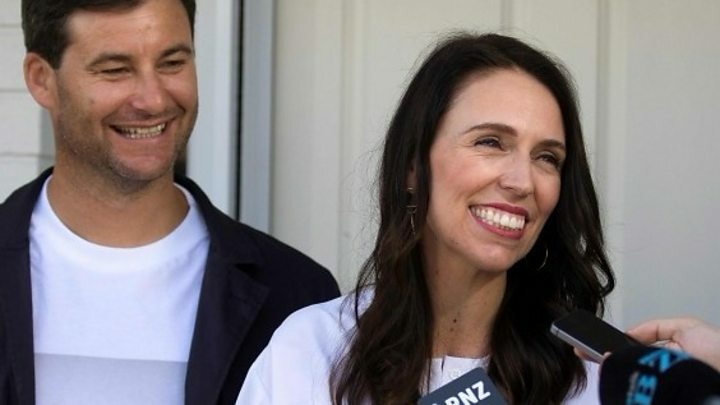 "As is the case when I am overseas, Mr Peters will act as prime minister, working with my office while staying in touch with me," Ms Ardern said in a statement reported by the New Zealand Herald on Friday. "I fully intend to be contactable and available throughout the six-week period when needed." Ms Ardern said she discovered her pregnancy only six days before learning she would be prime minister, and it was "100% a surprise". "I am not the first woman to multi-task. I am not the first woman to work and have a baby - there are many women who have done this before," she said. Mr Gayford would be a "stay-at-home" dad, she added. Two of New Zealand's former prime ministers were among the first to offer congratulations. Australia's Prime Minister Malcolm Turnbull also shared best wishes from himself and his wife. Ms Ardern took over the Labour leadership in July. She later said that she had an hour's notice that Andrew Little was about to stand down. On her first day as opposition leader, Ms Ardern was controversially asked by a TV talk show host whether she had made "a choice between having babies and having a career". Ms Ardern replied that such a question was "totally unacceptable in 2017". "It is a woman's decision about when they choose to have children and it should not predetermine whether or not they are given a job or have job opportunities," she said.